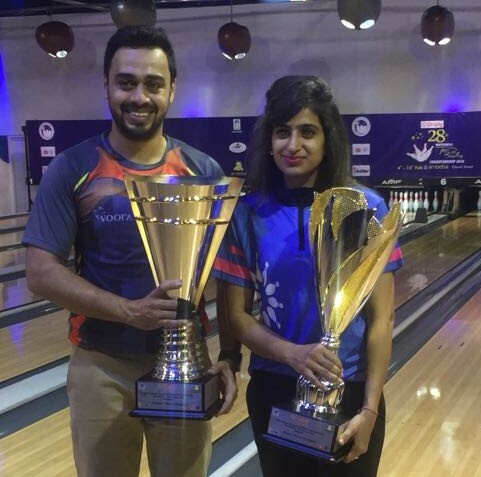 Shabbir Dhankot of TamilNadu & Anukriti Bishnoi of Haryana won National titles at the Uniply 28th National Tenpin Bowling Championships, which concluded at Amoeba, Church Street, Bangalore. 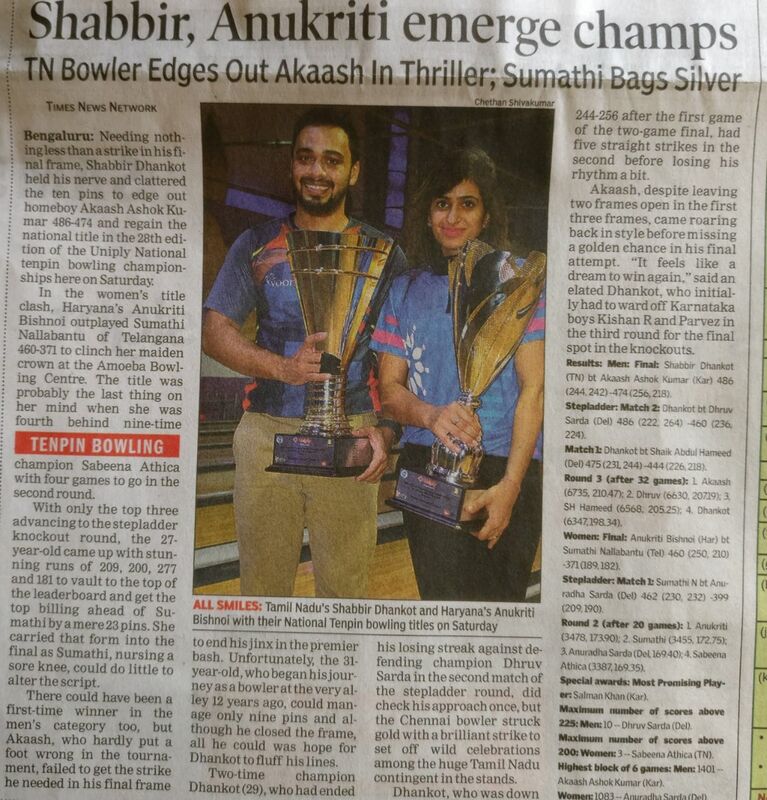 In Men’s category, Shabbir Dhankot (TN) won his 3rd National title defeating top-seed Akaash Ashok Kumar of Karnataka (486 – 474) by 12 pins. 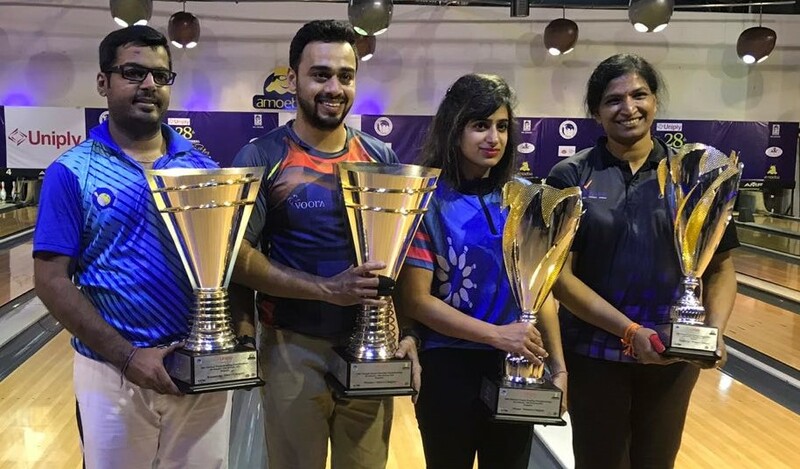 In the Women’s category top-seed Anukriti Bishnoi (HAR) won her First National Title defeating Defending Champion Sumathi Nallabantu of Telangana (460 –360) by 100 pins. 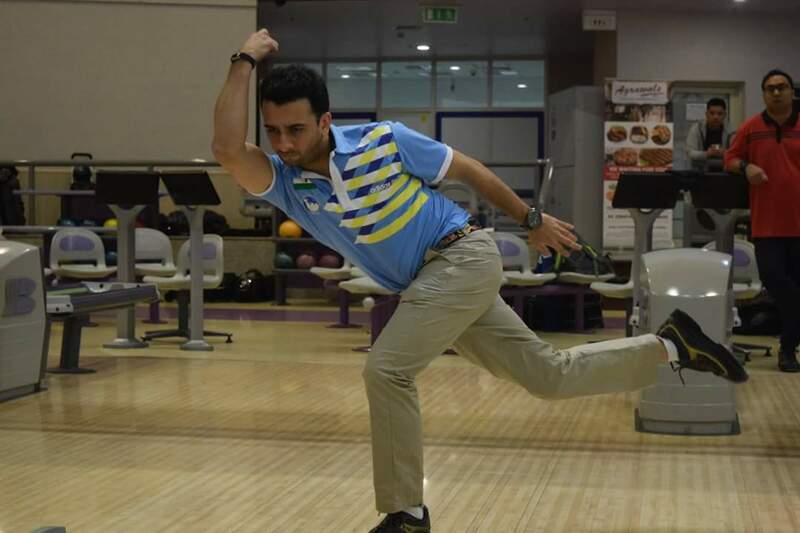 Earlier in the day, in the stepladder round, played based on cumulative pinfall of two games, in Match 1 of Men’s category, 3rd placed S A Hameed (DEL) lost to 4th placed Shabbir Dhankot (TN) (475 – 444) by 31 pins. 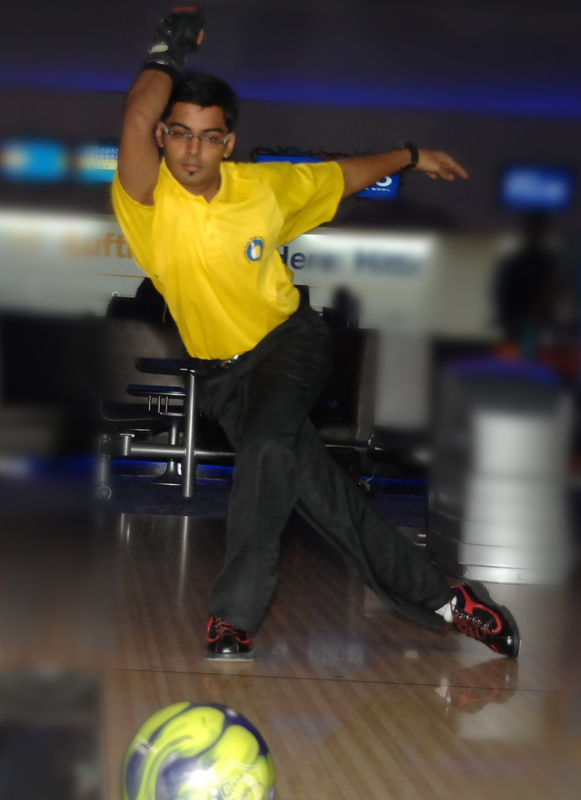 In Match 2, Shabbir Dhankot (TN) beat Defending Champion Dhruv Sarda (DEL) (486 – 460) by 26 pins. Shabbir was trailing by 14 pins at the end of Game 1, scored 3 strikes in a row to end Game 2 with a score of 264 as against 224 of Dhruv and moved to Finals. In Match 1 of the stepladder round of Women’s category, 2nd placed Sumathi Nallabantu of Telangana comfortably beat 3rd placed Anuradha Sarda (462 - 399) by 63 pins to move to finals against Anukriti of Haryana. In the Men’s category, Akaash Ashok Kumar of Karnataka (6735 pinfall & 210.447 average) finished at the top position after 32 games, followed by Dhruv Sarda of Delhi (6630 pinfall & 207.19 average), S A Hameed of Delhi (6568 pinfall & 205.25 average) & Shabbir Dhankot of TamilNadu (6347 pinfall & 198.34 average) in 2nd, 3rd and 4th positions respectively and qualified for the stepladder round earlier. 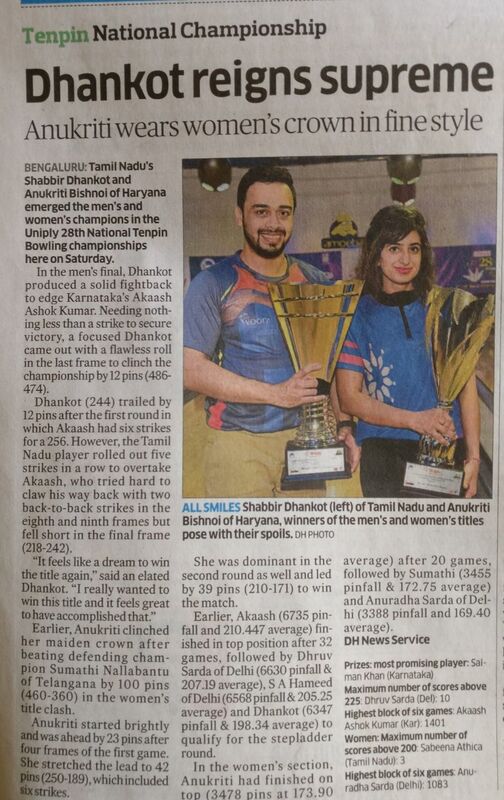 In Women’s category Anukriti Bishnoi (HAR) finished at the top spot (3478 pins at 173.90 average) after 20 games after Round 2, followed by Sumathi Nallabantu of Telangana (3455 pinfall & 172.75 average) & Anuradha Sarda of Delhi (3388 pinfall and 169.40 average) at 2nd and 3rd positions respectively. 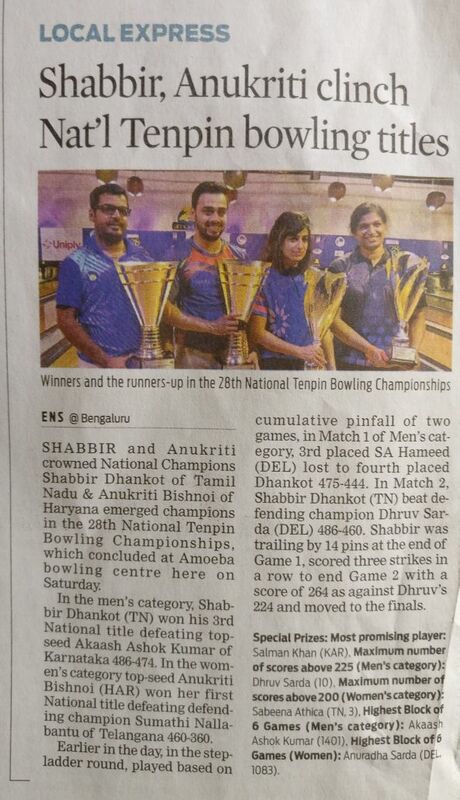 Former Commonwealth Medalist Shaik Abdul Hameed was in blistering form scoring 1320 pins in Round 2 of Men’s Category of the Uniply 28th National Tenpin Bowling Championships, currently underway at Amoeba, Church Street, Bangalore. 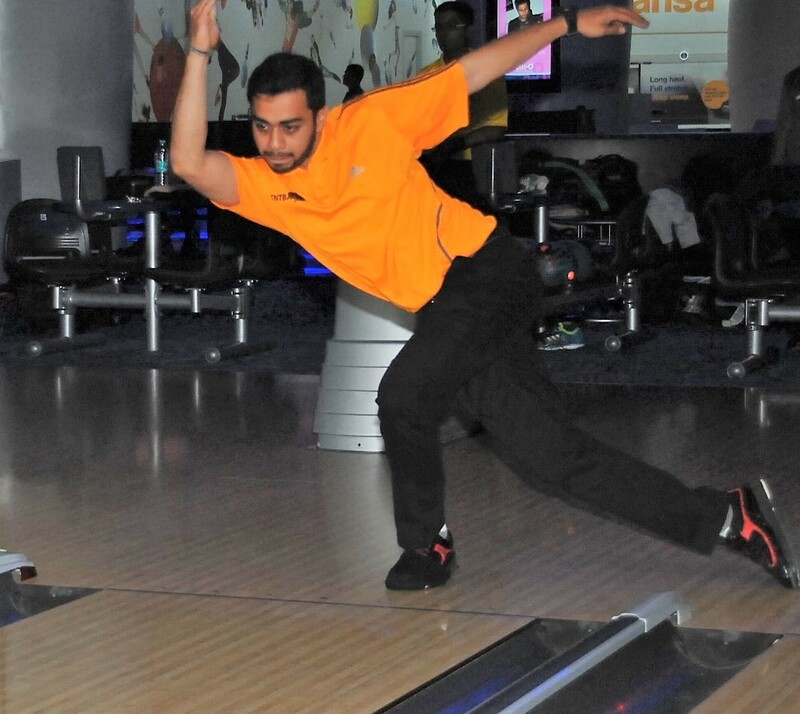 Hameed who played 3rd block of 6 games on Long oil conditions started the day with high game of 235 in Game 1 and bowled steadily in the next 4 games scoring 208, 266, 179, 205 in Game 2, Game 3, Game 4 and Game 5. He finished the day with a high game of 227 and finishing the day with total pinfall of 1320 at an average of 220. Hameed who was placed 13th overnight jumped to overall 4th position. Akaash Ashok Kumar (1196) continues to stay on top at the end of Round 1 followed by Dhruv Sarda (3632) in 2nd position and Shabbir Dhankot (3556) in 3rd position. In the Women’s category, Anuradha Sarda (2121) of Delhi finished on top of the table after 2nd block of 6 games in Round 1. Defending Champion Sumathi Nallabantu (2024) of Telangana is in second position and is trailing Anuradha by 97 pins. Sabeena Athica (2013) of TamiNadu and Anukriti Bishnoi (1973) of Haryana are in 3rd and 4th positions respectively. 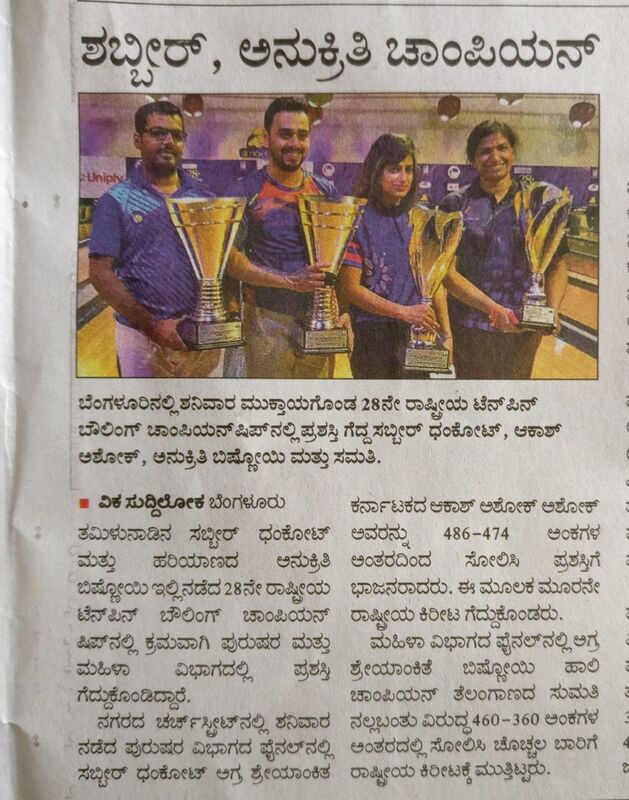 At the end of Round 1, top 8 Women bowlers made it to Round 2 which includes 2 Bowlers from Karnataka, 2 from Telangana and 1 each from TamilNadu, Delhi, Haryana and West Bengal. As part of Round 2, top 8 Women bowlers will bowl two blocks of 4 games each. Top 12 Men Bowlers based on total pinfall of 24 games will move to Round 3 and will play 8 games (4 games on Long oil and 4 games on Medium oil) tomorrow morning. Top 4 Men based on cumulative pinfall of 32 games will move to Final round, to be played tomorrow afternoon. Top 8 Women bowlers who moved to Round 2, will play 8 games (4 games on Long oil and 4 games on Medium oil) tomorrow morning. Top 3 Women based on cumulative pinfall of 20 games will move to Final round to be played in the afternoon. Finals will be played at 5:00 pm tomorrow and Prize distribution function will be held at 6:00 pm. 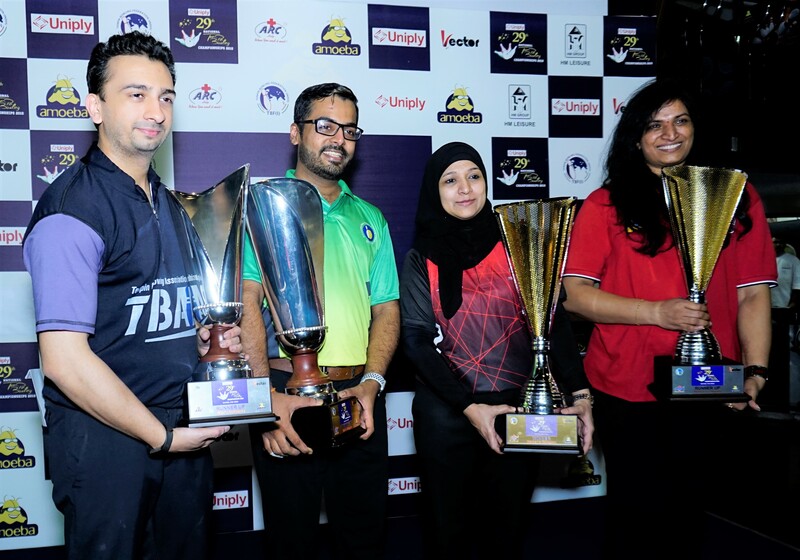 Anuradha Sarda of Delhi topped the table in the Women’s category, with total pinfall of 1083 on Day 3 of the Uniply 28th National Tenpin Bowling Championships, currently underway at Amoeba, Church Street, Bangalore. 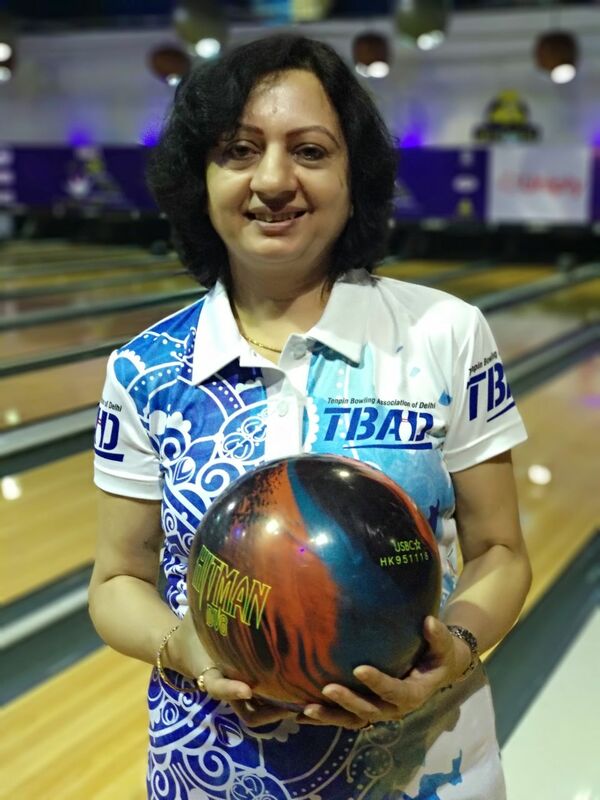 Playing her first block of 6 games in Round 1 on Long oil conditions Anuradha Sarda (DEL) started the day with score of 176 followed it up with scores of 177, 180, 188, 162 and 200 in the next 5 games and finished the day with total pinfall of 1083 at an average of 180.50. Defending National Champion Sumathi Nallabantu (Telangana) is currently placed second with total pinfall of 1035. 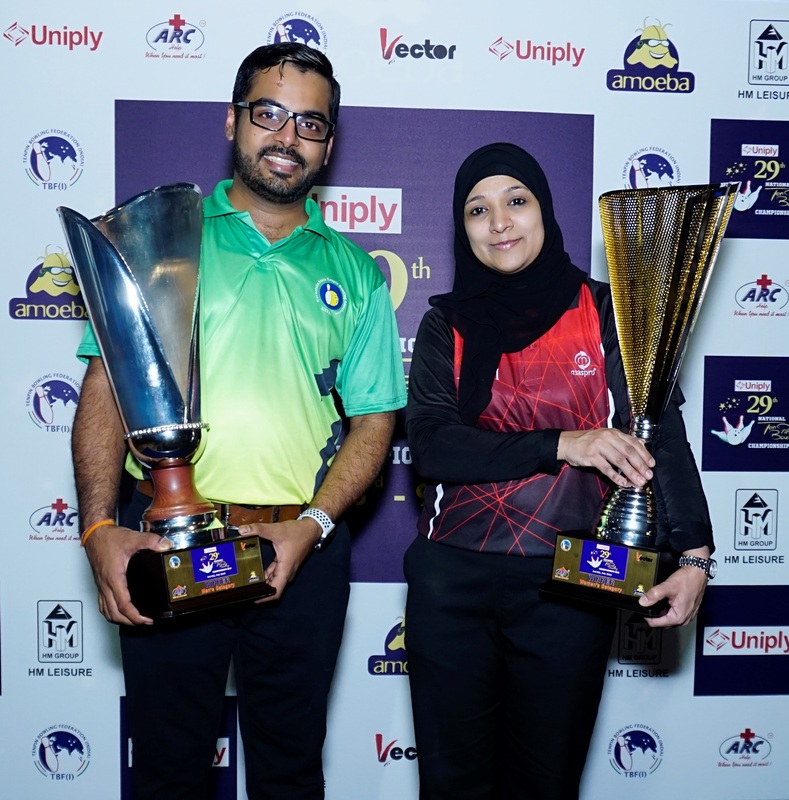 Sumathi who was leading the table at the end of Game 4 surrendered the lead to Anuradha with a low game of 126 in Game 5. She bounced back with a high game of 202 in Game 6, but still trialing Anuradha by 48 pins at the end of first block of 6 Games. 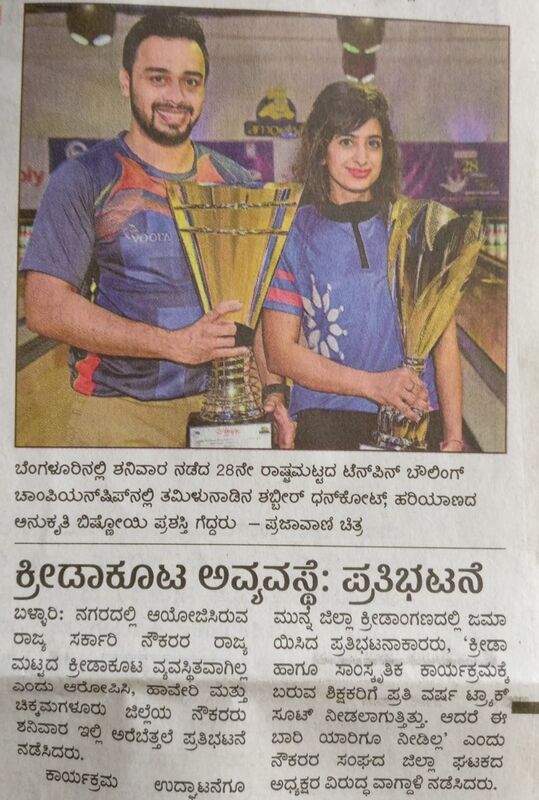 Geetha Poojary of Karnataka scored 172, 139, 150, 146 and 177 in the first 5 games and in Games 6 she scored 222 to finish in Third position. Anukriti Bhisnoi (993) of Haryana is in Fourth position. 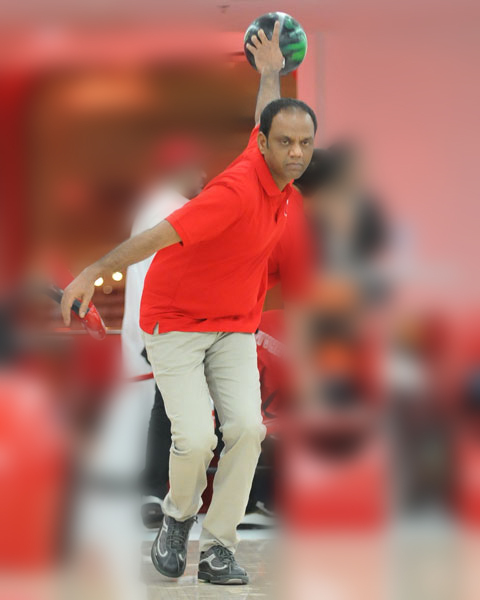 In Men’s category, at the end of Round 1, Top 40 Men bowlers, ranked based on total pinfall of 12 games moved to Round 2, which include 14 Bowlers from TamilNadu and 11 Bowlers from Karnataka and 3 each from Delhi and Telangana, and 2 each from Maharashtra, and 1 each from West Bengal, Gujarat, Kerala, Goa and Haryana. Akaash Ashok Kumar (KAR) consolidated his lead over other competitors. Akaash is leading the table with total pinfall of 2567 at an average of 213.92 in 12 games and he is leading over second placed Defending Champion Dhruv Sarda (2438) by 129 pins. Parvez Ahmed (KAR) is in third position with total pinfall of 2346. 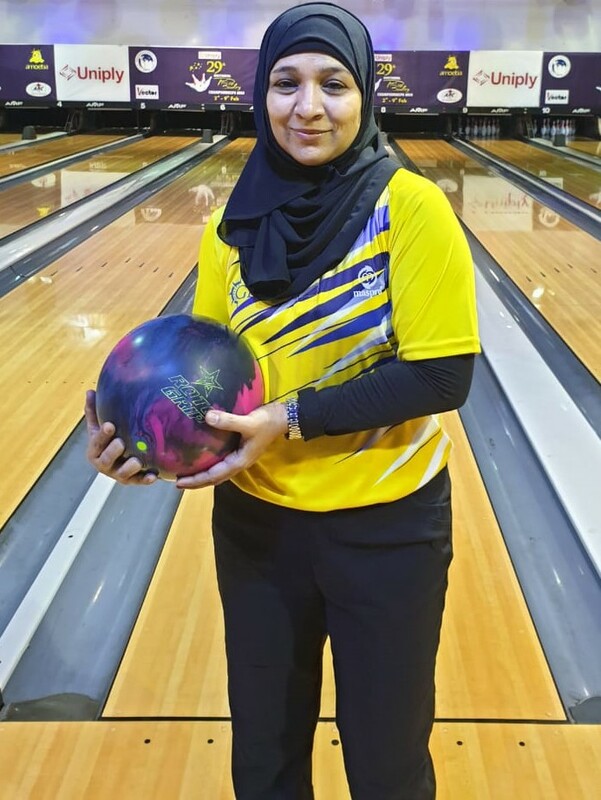 In the Women’s category, all bowlers will bowl second block of 6 games as part of Round 1, tomorrow morning and in the Men’s category, in Round 2, all 40 bowlers will bowl their 2nd block of 6 games on Medium oil.